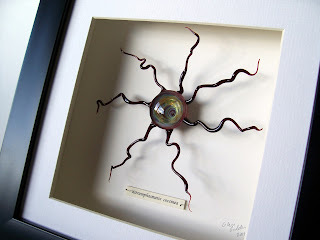 The exciting news is that I have some of my Alien Specimens in an exhibition, starting on Friday! The collection is entitled 'Glass' and features work from 30 different glass artists at the Cuploa Gallery in Sheffield from 3rd May to 16th June. This is quite a major show, it's been quite a surprise to see myself (and a picture of one of the Aliens) featured in press releases and emails from other mailing lists I'm on of upcoming exhibitions. I really wanted to go up for the opening night, but I just don't think I can make it as I only found out I was including a short time ago (thanks to some lost emails) and it seems all the trains and hotels rooms in Sheffield seem booked that weekend. This was by selection only, so I was delighted to hear I'd been chosen! One lobster didn't make it, thanks to the post office, and arrived upside down in a box clearly marked 'this way up,' one of the gallery directors told me he saw the driver offloading it, and was surprised that only one was broken. Not as bad as one artist though, for whom every item he sent arrived smashed. However the lobster I know can be rebuilt, and will give me the excuse to make some tweaks to it that I wanted to make. This does mean I won't have very many aliens to take to the MCM Expo in London, but space is limited there this year, and hopefully the ones in Sheffield will now find new homes, then I can use the proceeds of their 're-homing' to fund making some more new and exciting ones!